So much to discover, an explorer's paradise. Fingal Bay was originally known as False Bay as, in the 19th century, it was sometimes mistaken for the entrance to Port Stephens. This picturesque village is surrounded by the Tomaree National Park. A magnificent beach with an infamous walk across “the spit” to view the burnt out ruins of the outer lighthouse residence. Explore Fingal Head and enjoy the views. There is some great fishing off the beach as well as the Headlands. Many large fish has been landed off the spit. This beach is very popular with surfers and is quite protected by the headland in the southern corner. Tomaree National Park conserves coastal bushland, sand dunes, heathland, forest areas and over 20 kilometres of rocky coastline and beaches. There are excellent opportunities for bushwalking, swimming, snorkelling, surfing, fishing and picnicking. Fingal Bay has a resort, a patrolled beach, a boat ramp and fishing from both the beach and from Fingal Head. Whales can sometimes be spotted offshore between September and November or, less frequently from late May to July. They like to rub their barnacles off on a reef 50 m offshore. 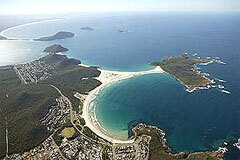 There is a good range of holiday units, houses and other accomodation available at Fingal Bay. The holiday atmosphere, fresh sea breezes and natural beauty of Fingal Bay make for a perfect romantic few days; or a great place for the family to have a holiday.